Welcome to Money Smart Week! On this April fool’s day, we at the Kirstein Business Library & Innovation Center want to take the time to help you avoid parting with your money because of unscrupulous business people. But before we discuss how to avoid fraud and what you can do to protect yourself, we thought we’d delve into some local history. One of the first incidents of modern financial fraud as we know it happened in Boston in the late 1870’s. 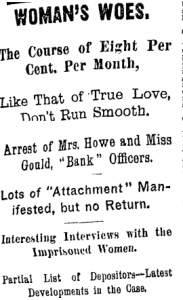 Sarah Howe started the Ladies' Deposit Company, a savings bank targeted toward unwed women. Howe promised a very high interest rate (8 percent a month!) on the deposits and relied on referrals to attract new customers. Howe used the deposits she collected from new customers to pay the large returns she promised. The Boston Daily Advertiser caught wind of the scheme and began publishing articles about the scam in 1880. The articles eventually led to Sarah Howe’s conviction and a 3 year sentence. But, Ms. Howe is not the only former Bostonian to engage in fraudulent financing. Quite the Dapper Dan, right? Copyright (c) Leslie Jones. All rights reserved. 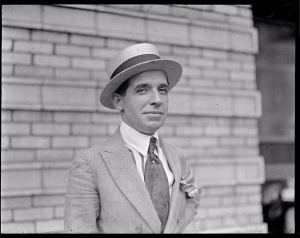 Charles Ponzi perpetrated one of the most famous money making schemes in history—and he became the namesake for similar large scale fraudulent financial schemes. By redeeming international postal reply coupons for US stamps, Ponzi learned he could make a profit. You see, the redemption rates for these coupons were set by treaty, so Ponzi could purchase the coupons from European nations whose economies were weakened by Word War I. This bit of arbitrage brought Ponzi riches quickly. Ponzi convinced thousands of people to invest and many never saw returns. Eventual Ponzi’s lavish lifestyle, his swift rise in wealth, and his inability to pay his debts aroused suspicion. Both Ponzi and Howe preyed on folks who wanted high returns. But the general rule of thumb is, if it seems too good to be true it probably is. So how can you avoid financial fraud? Don’t share numbers or passwords for any bank accounts and credit cards. Don’t share your social security number either. Take time to compare prices and returns. Ask for information in writing, read it carefully and review the paperwork with a neutral third-party. If a broker or sales person is pressuring you to wire money before you can get legal/financial advice, it’s most likely a scam. If you have fallen victim to fraud you should use the resources listed on the Consumer Financial Protection Board’s Website.